Microsoft's Windows Phone Smartphone series are now getting popular amongst users worldwide and many Mobile Manufacturer Companies including Samsung Mobile, Nokia, HTC and many more are preparing and developing some promising and high-tech Windows Phone 8 Smartphones and Tablets for users, but it seems that most of the Smartphones and Tablets device users are confused and they don’t know Which Windows Phone 8 Smartphone is Best? for them according to their needs. So today in our post we will discuss the Best Windows Phone 8 Smartphones from Samsung, Nokia Lumia and HTC mobile makers. 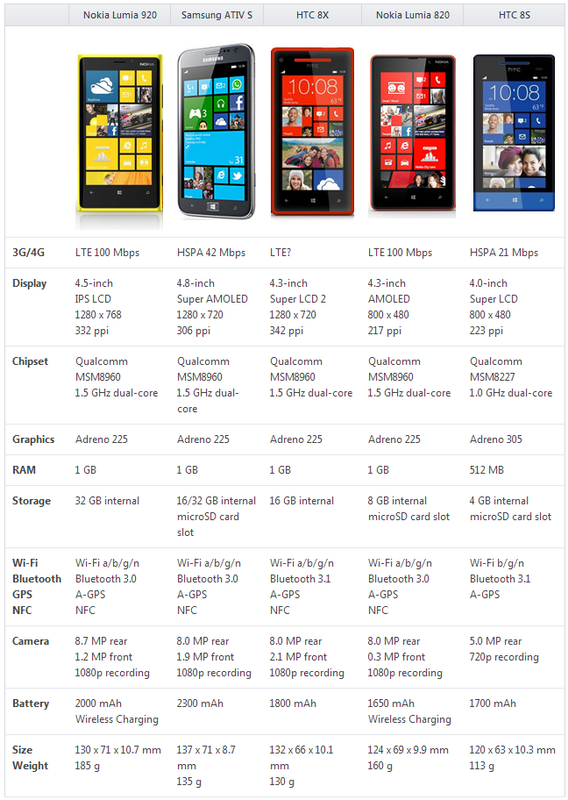 We are sharing Infographic of Nokia Lumia 920 Windows Phone 8 Smartphone, Samsung ATIV S Windows Phone 8 Smartphone, HTC 8X Windows Phone 8 Smartphone, Nokia Lumia 820 Windows Phone 8 Smartphone and HTC 8S Windows Phone 8 Smartphone Specification Comparison Chart with Availability and Price details which helps you in Best Windows Phone 8 Buying amongst Samsung, Nokia Lumia and HTC Windows Phone Smartphone series.